Sugarbag bees are fun. Young kids are always surprised to discover some Australian bees are both tiny and without a sting. Once they understand these bees are safe company, they can’t resist taking a closer look and become absorbed by the antics of these industrious mini-bees. I like watching bees on housekeeping duty. Housekeeping is for young bees. Older and more experienced bees graduate through guard duty to eventually become foragers. Every day the housekeeping bees work hard, dragging out lumps of garbage, often as big as themselves, keeping their home and nursery clean and disease-free. When a hive is ready to swarm and multiply, Queen European honeybees lay several queen bee eggs. The first to hatch claims her top role as a new queen by stinging her siblings to death. The new queen rules alone. Australian stingless bees have multiple queens and they lay multiple queen eggs. When these hatch, the hive decides which individuals to keep and which to cull. In a way, they ‘elect’ their leaders. A nasty discovery turned me to native bees; my part of Brisbane is badly affected by pests and diseases of European honeybees. Pests like small hive beetle and diseases like American Foul Brood and European Foul Brood meant disaster for six hives. My crops still needed pollinating so I began planting to attract native bees and my first hive of sugarbag bees (Tetragonula carbonaria). I have yet to find anyone who doesn’t get hooked by their first taste of rich, aromatic sugarbag honey. I think the very scarcity of sugarbag adds to its richly aromatic smell and taste of ripened nectar. Each hive only produces a litre or so each year. Every drop is precious, and their pollination services are vital in a home food garden. It’s a marvellous things to experience a swarming hive. Once, during filming, we worked while a hive under the back steps was swarming. The air shimmered with their black, busy bodies. Setting up a filming sequence required us to walk repeatedly through this cloud of bees. If we walked slowly, they parted as we passed. It was lovely being enveloped by such energy. Stingless bees provide general pollination services, like the European honeybee. Currently Australia is the last place on Earth still free of the destructive Varroa mite, a major threat to the honeybee. 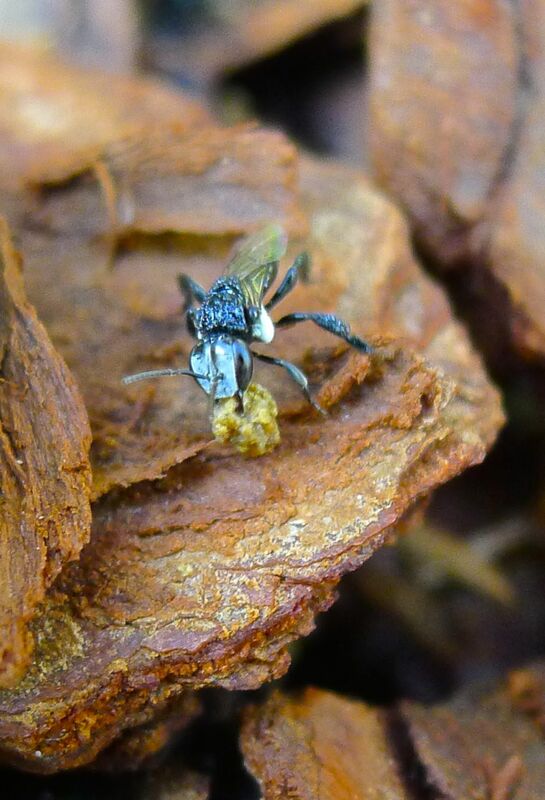 If this pest is introduced, then stingless bees will not just be valuable for their pollination services in coastal Australia, they will become essential for small to medium scale farming. According to Dr Tim, suburban gardens provide excellent, diverse foraging for stingless bees and if I have the right spots with the right conditions for hives, my 813 square metre property could accommodate up to 100 hives. Now that’s what I call factory farming with a future. Every year I split my hives, because in the long term it’s vital for keeping them invigorated. Today my friend Dr Tim Heard, who specialises in Australian bees at the CSIRO, supervised splitting my three hives. Tonight I own five, three of Tetragonula carbonaria and two of T. hockingsi, (the latter being suited to coastal Queensland). For detailed information, and the supply of hive equipment and stingless bees, please contact Dr Tim Heard via his website. Good work to you Jerry with your stingless bees project. I work for the beekeeping training Institute – Tabora Tanzania, East Africa and I also keep bees both stinging and stingless bees. I would like ask you to share with me some beekeeping articles, hands-on learning materials to improve my beekeeping. You’ll have good bee-diversity in Tanzania. If you email me via this website, I can send you an article I had published in a national gardening magazine. Dear Jerry, much thanks from your positive response. Your quite right, we probably have good diversity, though little studies has been done on bees. Looking forward hearing from you Jerry.